In case you took a break from the entire internet for a week and avoided going outside, there's been sort of a craze lately with this little-known app called Pokémon Go. The augmented reality (AR) game has successfully ejected tens of millions players off their couches to encounter rare and wondrous beasts out in nature - or their twentieth Magikarp at the local Arby's - as well as gave Nintendo's stock its biggest boost in over 30 years, according to The Guardian. Despite Ninty only having one-third control over The Pokémon Company, the multi-corporate group behind the pocket-monster machine, the game/hardware maker could stand to learn a thing or five from Pokémon Go's success. As smartphones get more powerful, coupled with grander ambitions, like Microsoft HoloLens or Magic Leap's hyped-up mystery display, AR is going to be less of a buzzword and more of a legitimate means for people to blend the digital world with meatspace. This is where Nintendo has an advantage. Pokémon Go's developer, the previously owned-by-Google Niantic Labs, has been working with AR in gaming since 2012 with its past title, Ingress. Imitators will come - we've even got some great ideas for some ourselves - but it's up to Nintendo to stay ahead of the curve. 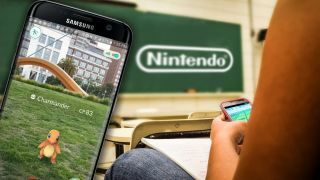 Niantic is on its way to becoming a major name in AR and GPS gaming; Nintendo needs to hold on to that shiny new feather in its cap and never let go. The Nintendo NX should be here by spring, and yet we know diddly squat about the upcoming system. The elusive piece of hardware is reportedly going to be a hybrid of a console and a handheld - or possibly even a venture into virtual reality - but the true identity of Nintendo's next project is a closely guarded secret. That said, the idea of combining gaming on-the-go with a console has us thinking, what if the NX used smartphones as its handheld counterpart? Even if it couldn't replace something more precise like a controller or a 3DS, a smartphone could potentially fit in for a second screen, à la the Wii U, or supplement the console experience, like Xbox SmartGlass or the Mass Effect Datapad companion app. It would also take advantage of a major install base, because who doesn't have a smartphone? Nintendo is a company that's very choosy with who works on its properties. OK, maybe except for that one time. The Pokémon Company's gamble on Niantic brought players in by the droves, but there are plenty of other app makers Nintendo could place bets on, too. Fire Emblem and the so-perfect-for-mobile-it's-scary social sim Animal Crossing are the next two series awaiting smartphone treatment, but we hope Nintendo has more ideas still sitting in the chamber. Nintendo's experiment with app-based gaming was wrought with trepidation, with the company citing branching out to new avenues as vital to keeping the company and its arsenal of beloved brands alive. However, since announcing its partnership with mobile developers and dipping its toes for the first time, it's clear Nintendo is as comfortable on your Samsung as it is on the 3DS. The first Nintendo-backed app, Miitomo, didn't quite set the world on fire, but still hit 3 million users in just 24 hours. Pokémon Go, however, managed to usurp Candy Crush Saga as the biggest mobile game in US history, according to SurveyMonkey. To repeat: Pokémon Go beat Candy Crush Saga, a.k.a. the game Call of Duty publisher Activision paid nearly $6 billion to acquire. Creating fun, yet simple games that everyone can enjoy is Nintendo's bread and butter. Developing for smartphones was almost like kismet for them. Heck, Nintendo believed in touchscreen gaming way before it was cool with the original DS, so they've practically written the book on it. For those more inclined to sit in one place to catch all their 'Mons, there will still be a more conventional Pokémon release this fall with Pokémon Sun and Moon. While the series is known to make its own incremental advances with each new entry, the potential currently tapped by Pokémon Go could wind up wasted if The Pokémon Company leaves both projects cordoned off from each other. The Pokémon Bank, a subscription service that can store up to 3,000 Pokémon online for $5 a year, was a nod in the right direction, giving Trainers a faster and easier way to ensure they won't lose their creatures each time a new game comes out. That said, much more could still be done to tie together your lifetime collection of Pokémon, battle buds, and pending trades with the internet. The Pokémon Trainer Club already serves as a pseudo-social network for Pokémaniacs - lean into it! Of late, Nintendo's history with the internet and its titles has been begrudging, at best. If there's one thing Pokémon Go should teach the company, it's that moving forward in a connected world full of fans wouldn't just benefit Pokémon, but any future projects The Big N is working on, too.